On 7th September 1971, a man in Tring threatened members of his family with a shotgun. When the police arrived, the man fired at them and members of the public indiscriminately. A coach was peppered with shotgun pellets but fortunately no-one was injured. Despite certain police officers being authorised to use firearms, there was no armoury at Tring police station. Consequently, one local officer knocked on the door of a local resident who owned a gun and asked if he could borrow it. 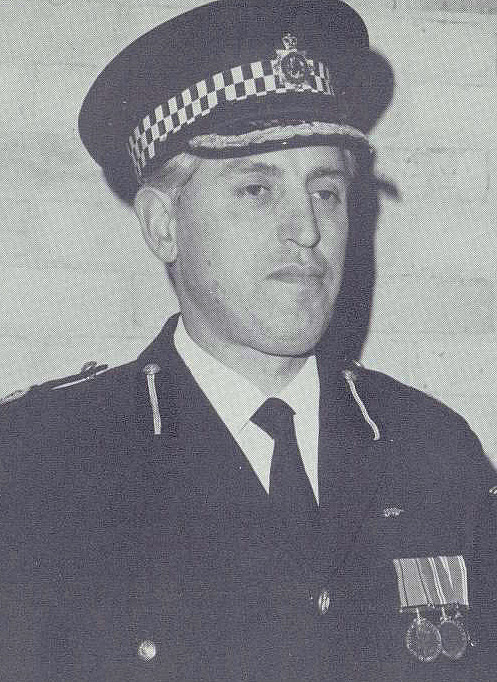 Assistant Chief Constable James Hilton Brownlow (pictured), attended the scene in person and took command. The police successfully persuaded the man to release the members of his family, whom he’d been holding hostage, but he refused to surrender his weapon or come out from his address. Despite being unarmed himself, A.C.C. Brownlow confronted the man and ordered him to give himself up. The man threatened to shoot him but he stood firm and maintained dialogue. 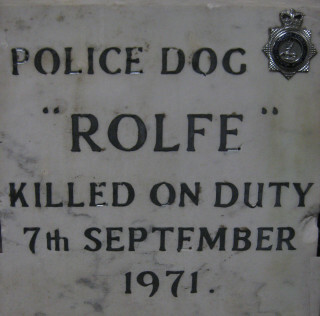 As the siege continued, a police dog called Rolfe was sent in to bring the man under control. Sadly, the assailant shot the dog as it ran towards him and it suffered fatal injuries. A.C.C. Brownlow and other officers then stormed the house and used C.S. gas to finally bring the man under control. The gun lent to the police wasn’t actually used. Consequently, it was returned to the local resident, along with the ammunition. When its owner died, some twenty years later, the same gun was handed in at Tring police station for disposal. For his extreme bravery, A.C.C. Brownlow was awarded the Queen’s Commendation for Brave Conduct. He left Hertfordshire Police on 1st August 1977 to become the Deputy Chief Constable of Greater Manchester Police. In 1979 he became the Chief Constable of South Yorkshire Police and retired in 1983. He died on 25th October 2012. A permanent memorial to police dog Rolfe was installed at the Force’s Headquarters in Welwyn Garden City (pictured). This page was added on 13/05/2014. 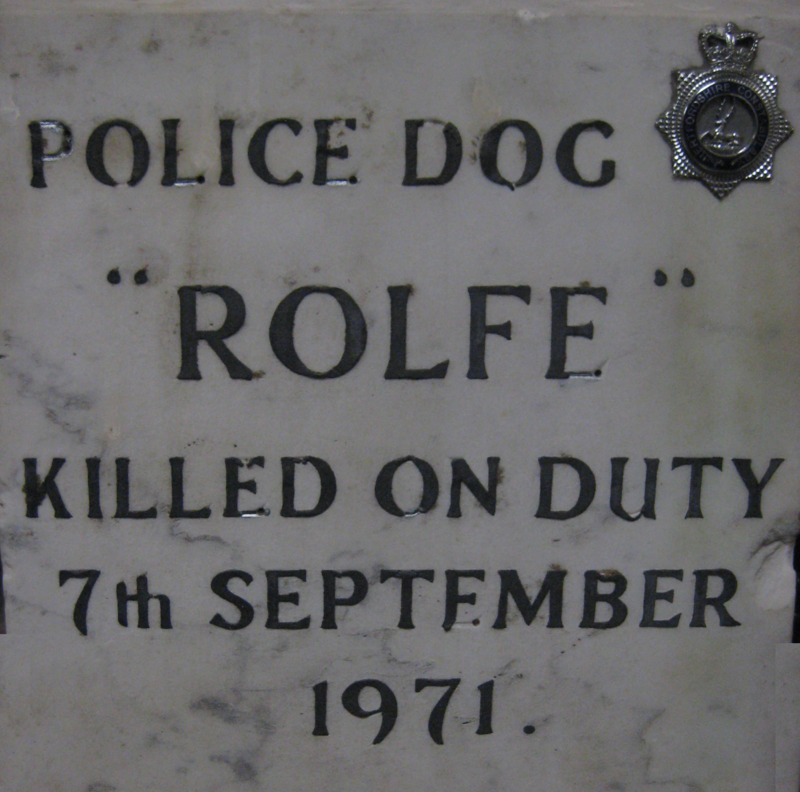 What a heroic Man he truly was – and how heartbreaking that poor Rolfe died in the course of duty. Thanks for posting this article, and indeed all the others – a fascinating read indeed! I must admit I particularly like the photographs of how Towns in Hertfordshire used to look, as well as seeing the vehicles that have been used over the years. I have been a fervent Ford fan all my life ; in fact I used to be friends with a Police Officer from Essex Constabulary. We would meet at the various Ford shows where he would proudly show off his Mark 5 Cortina 2.0 GL, and even managed to track down all of the necessary equipment to make his car a perfect replica of what I think would have been used as an “Area Car” in the early to mid 1980’s…….I also know Gareth Rees via his Dad Ron,who I worked with many years ago – I hope Gareth continues to make a good recovery. Can anyone help identify this Herts Police Officer ? Eynsham Hall Training Centre, Witney, Oxon.